Featuring multi-layer protective design, our Riot Groin Protectors provides excellent shock absorbing protection. We are a nonpareil Manufacturer, Supplier and Exporter of Riot Groin Protectors from China. Our Riot Groin Protectors have four inch elastic with hook and loop wraps around thigh for secure attachment and a web belt secures the system to the waist. The entire range of the Groin Protectors is reasonably priced by us. Designed to compliment the Centurion™ Upper Body Chest and Shoulder Protection System, it was specifically designed for blunt trauma protection during riot control situations. 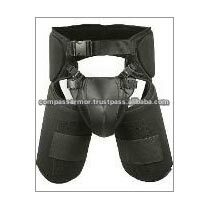 It protects the thigh area and has an adjustable and removable groin protector.